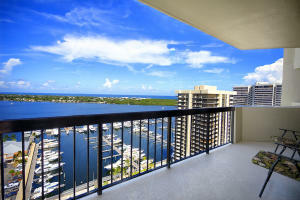 123 Lakeshore Drive #2145 North Palm Beach, Fl 33408 has been sold. You can view available homes in Cove Tower. STUNNING 2 BEDROOM/2 BATHROOM WATERFRONT CONDO ON THE 21ST FLOOR IN THE SOUGHT AFTER COMMUNITY OF OLD PORT COVE. ENJOY EXPANSIVE WATER VIEWS OF OLD PORT COVE MARINA, THE INTRACOASTAL AND OCEAN FROM YOUR LIVING ROOM OR LARGE WRAP AROUND BALCONY. UPGRADES INCLUDE IMPACT SLIDERS THROUGHOUT, FULLY REMODELED KITCHEN WITH GRANITE COUNTER TOPS, SS APPLIANCES AND STONE BACKSPLASH, UPDATED 2ND BATHROOM, CROWN MOLDING THROUGHOUT, NEWER AC, WATER HEATER & MORE. NINE FOOT CEILINGS THROUGHOUT THE CONDO ADD TO THE ALREADY SPACIOUS LIVING AREAS AND BREATHTAKING VIEWS. LARGE MASTER SUITE FEAUTURES EN SUITE BATHROOM WITH DUAL VAINITES, SEPERATE SHOWER AND TUB AND TWO WALK IN CUSTOM CLOSETS. 123 Lakeshore Drive #2145 located in North Palm Beach, FL is a condo with 2 bedrooms, 2 full baths and 0 half baths.The Condo at 123 Lakeshore Drive #2145 was built in 1980 in Cove Tower and offers a 0 car garage. This Cove Tower Condo offers pool, community room, library, sauna, sidewalk, manager on site. 123 Lakeshore Drive #2145 North Palm Beach, Fl is currently listed for $549,000 under the MLS# RX-10462155. This Condo has been put on the North Palm Beach MLS system and currently has a status of SLD. Information in regards to North Palm Beach real estate and Cove Tower Condos for sale or any other areas may have come from a cooperative data exchange service. All rights reserved. Information deemed to be reliable but not guaranteed. The data relating to real estate for sale on this website comes in part from the IDX Program of the Florida Regional MLS. Listing broker has attempted to offer accurate data, but buyers are advised to confirm all items. We provide all information about North Palm Beach Condos for sale and Cove Tower real estate and all other site listings as is with absolutely no warranties. This site will be monitored for 'scraping' and any use of search facilities of data on the site other than by a consumer looking to purchase real estate, is prohibited. Feel free to contact our agents to find a great Cove Tower North Palm Beach specialist.